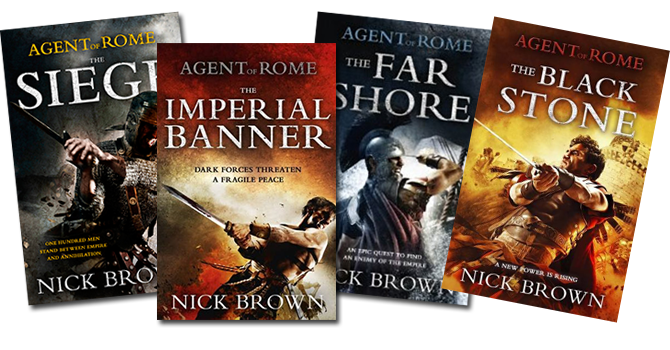 The Agent of Rome series is set in the third century AD and follows the adventures of imperial agent Cassius Corbulo. The Siege was released in 2011 and followed by The Imperial Banner, The Far Shore, The Black Stone and The Emperor’s Silver. Book six, The Earthly Gods, was released this summer. ‘Thrills from the outset.’ - Sunday Express. 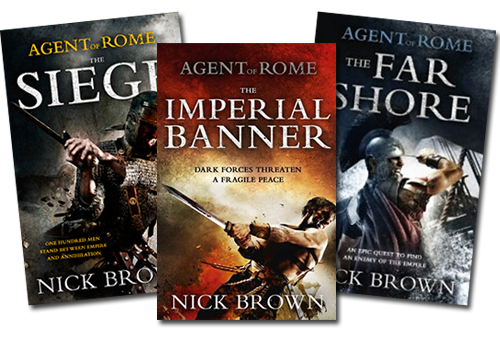 “Brown has become a master of his trade, serving up thrilling Roman history and mystery courtesy of a band of now hard-bitten combatants and comrades whose adventures in imperial wastelands and far-flung hotspots are becoming the stuff of legend.” - Lancashire Evening Post. “The writing is deft, the action swift and bloody and the characters believable and engaging.” - Manda Scott, bestselling author of the Boudica and Rome series. “Brown promises to be one of the most exciting sword-wielding writers in an ever-popular arena. – The Oxford Times. “Once the action kicks off you won’t be able to put it down.” – Anthony Riches, bestselling author of the Empire series. “A Roman James Bond.” – de Telegraaf, Holland. “A fast-paced, action-packed novel tinged with humour which brings alive the harsh reality of the period, the people and the culture.” - Historical Novels Review. “Nick Brown has the craft of storytelling at his fingertips … The Siege is a fast-paced and satisfying read.” – Russell Whitfield, author of Gladiatrix. “An exciting, engaging mix between Indiana Jones, Hercule Poirot and James Bond.” - SJA Turney, author of the Marius’ Mules series. FIND Agent of Rome ON FACEBOOK OR FOLLOW @randomrome ON TWITTER. Order the books from Amazon / Hodder & Stoughton or Waterstones.